With the number of new posts that media keeps on churning out, it can be difficult to reach the right audience, especially in today’s Facebook environment, where organic reach for big pages tends to be in the 1-2% range. That’s why publishers and content creators promote their posts. Even though Facebook is very reluctant to spam its users with unwanted posts, it also enables great targeting and other audience definition options, so the right posts can get to the right people. This is where the post boosting campaigns come in as part of Facebook Advertising. By using them, publishers expand the reach of their posts, get better user interaction and also have the ability to optimize for link clicks, telling Facebook to use the targeting algorithm to find people who like clicking on links and reading content on web pages. 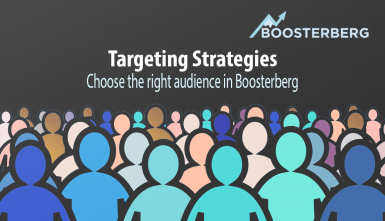 With Boosterberg, you can get the most out of these link-click optimized campaigns. 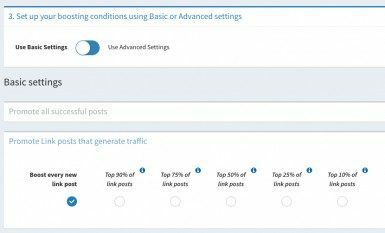 When starting out, you can use the basic preset – Promote link posts that generate traffic – and decide only what percentage of your link posts you want to boost (of course, concentrating on the better performing part). 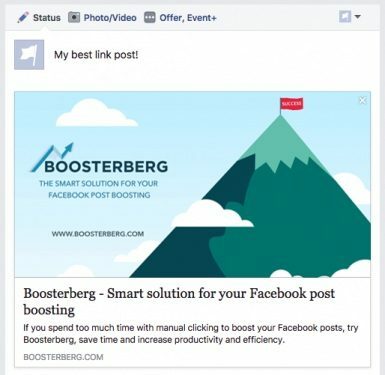 If you are more familiar with Facebook post boosting though, you can jump right into advanced settings. You have a website with regular post content, that also creates regular link posts on your Facebook page. You want to drive traffic to your website to get the most page views. In addition, you regularly do promoted deals and share links from other websites on your Facebook page. 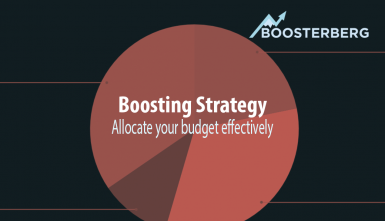 Normally, you would use just the “Boost Post” button under your posts and give a specific budget for one post, if you see that a post is getting traction (it seems to get more organic reach that others, so people like it). 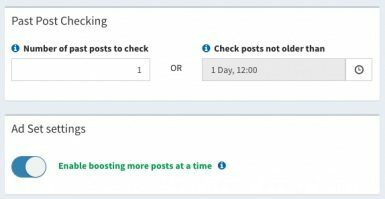 This is not optimal for multiple reasons – discounting the need to regularly look on insights to evaluate the posts and the need to manually click multiple times each day, it’s not effective to limit posts to a specific budget one by one. 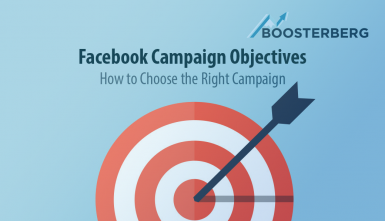 Instead, it would be better to boost multiple such posts using one Ad set with overall lifetime budget, and let the Facebook algorithm handle it – it will optimize for best results automatically. The next step is using Ads Manager to create an Ad set, but the post evaluation and clicking will not go away. After choosing your Page and Ad Account and creating (or importing) your audience and budget, go to advanced settings and leave just “Link” checked in the Post types option – this will make sure that only link clicks are boosted. Next, look for Min. Link Clicks boosting condition. 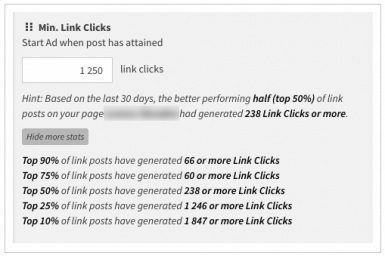 Check more stats underneath – if you see that the top 25% of your posts got 1246 link clicks or more, you can be pretty sure that if you set the link clicks boosting condition to 1250, roughly 25% of your best performing posts will be boosted in the future, so let’s set that up. Also, you only want to promote link posts that lead to your website, so put your domain into the Link URL keyword boosting condition – mywebsite.com. Now, for stopping the ads – you know best how your posts perform based on their recency – if they tend to fall off after 2 days, let’s put “2 days” into the Stop Ad after being created stop condition. Also, according to your preferences, you can limit the average CPC (Cost per link click) value that will cause the Ad to be stopped after 1 day, if the 24-hour average rises above your optimal threshold. We recommend starting loose here, and after examining the results, maybe tighten it a bit more to get the best result, while not limiting your posts’ potential too much. The point is not to get to an absolute minimum CPC for one post, but to get the long-term average CPC for your campaigns as low as possible. Let’s finish by putting “1 day and 12 hours” into the past Post Checking option, so Boosterberg will always check for posts published in the last day and a half to not boost posts that are not relevant anymore, and let’s also enable boosting more posts at a time, especially if you publish multiple posts daily that the Facebook algorithm can play with for optimal results. 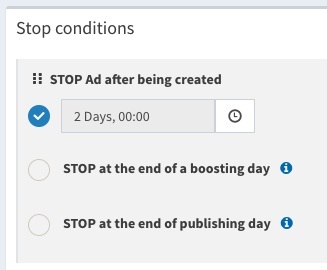 After submitting, Boosterberg will create a Campaign and Ad set with your audience and budget, but it will also start boosting all posts that meet the conditions that we have set up automatically and also stop the ones that meet the stop conditions.